Did You Know? 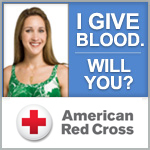 5 million patients in the US need blood every year. The need for blood is constant. If you could not give at the Carolina Blood Drive this past June 5th, we urge you to visit the American Red Cross website and find a drive or collection center near you. Donations are down 10% across the country. We need you! Give life. Give blood! This entry was posted in Community on June 29, 2012 by Lynn Eades.